Though we've lived in the same neighborhood for a long time, I'd never met Nora until this morning. 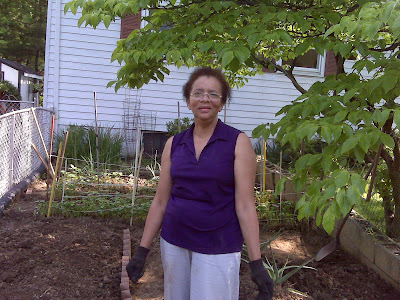 Her husband has always been the mainstay of their backyard garden, and during my beginning days of experimentation with my own garden, he was on my list of people to one day consult. I'd see him in his garden during drive, walk, and jog bys, recognizing him from afar with his trucker's cap, work pants, and button-down short-sleeved shirt. He'd be casually working his plot, hoe hanging from the low branches of the tree that frames his vegetables. Detailed in my (from the vault) post My Neighbor's Garden , I'd always thought it would be a good idea to seek out our gardening neighbors and learn their stories, but of course, there have been many excuses not to stop and chat. I'm working on jumping on more of these opportunities. On my run this morning, I thought it strange to see this woman working in the garden instead of the man I'd seen working on it every other time. Nora and I met when I asked her if I could snap her photo for my blog. I commented that I'd noticed a man typically working this plot. She said her husband has leukemia and recently had a stroke. He is in a wheelchair now. These days, Nora tends to the garden, finding relaxation and peace in her work. This morning, she told me she was working on tomatoes, and I noticed that she has moved some things around since she's taken over. Despite the changes this little garden has experienced, one thing that so obviously has carried over is the solace it provides the gardener. Join me in sending positive thoughts to Nora and her husband. I'm glad you stopped to meet Nora. It sounds like she could use some extra thoughts and prayers. Nora is one admirable woman! I respect her for continuing the efforts of her husband. Glad that she can still find time to work on the tomatoes in spite of the circumstances they are going through. Keep up the good job Nora. May you be blessed with much joy, restfulness and peace and your husband, healing and comfort! Tell Nora it's a blessing to her husband that she's working the garden. I'm glad she's putting her own stamp there, in moving things around. May she find comfort and peace there. I just said a prayer for her husband, too. Healing prayers are sent with this touching post, Wendy! Getting to know your neighbors through their gardens--I really like your project, and this is a really touching story. If I had anything keeping me from the garden I'd worry, but it's clear Nora has jumped in to keep the garden going, and at the same time found something restorative in what must be a really stressful time in her and her husband's lives. You are such a great writer, Wendy. Your kindness for humanity and penchant for giving importance to seemingly small things is such a gift. Thank you for giving your readers a glimpse into the world of your neighbors. She and her hubby will definitely be in my thoughts and prayers. Nora is carrying on her husband's passion for gardening. My friend's did the same when his wife fell ill. He took care of her garden even though he never gardened in his life. It's a good thing that you stopped by and chatted with Nora otherwise you would of never have known about Nora's husband illness. Hope he will regain his health and strength. With Nora taking over the job, hubby will have the assurance that his garden will not be neglected. I pray that he will be well and I hope that the garden will provide solace, joy and happiness to both Nora and her husband. Nora, it is very thoughtful and kind of you to share the responsibility with your hubby. And Wendy, you are kind and thoughtful too. I just noticed the other day that Nora has planted a wheelbarrow with perennials. It's just lovely. The garden just just as loved but has certainly taken on a more feminine touch. Although I only read about Nora and her husband here, I will certainly send happy loving thoughts to both of them. May they both be well and happy despite the health challenges that he is facing now.